The mass air flow sensor is prone to failure due to age or other factors affecting its performance. Common pollutants like dirt and dust are the major reason behind a failing air flow sensor. However, seeing how it functions all the time when you run your car, it is understandable that the sensor fails sooner rather than later. It is also possible that a voltage surge from the car battery fries the circuit inside the sensor and it is unable to transmit any information to the car’s onboard computer. At the end of the day, it is the ECU which decides what action to take and whether the mass air flow sensor has lost its efficiency. If the ECU suspects any fault, you are notified via a warning light (also called the Check Engine Light), that illuminated in the car’s dash. Engines use a mixture of air and fuel to operate. Without either one of them, the engine’s performance will be affected. To measure the amount of air that flows into the engine, automotive engineers have installed mass air flow sensors. These sensors calculate the air coming in and send the information to the car’s onboard computer, called the ECU, to analyze. Based on the valuable information received from the air flow sensor, the ECU makes the appropriate adjustments to the fuel and air ratio. Common mass air flow sensors have a very simple design. The sensor has two wires inside, of which one is heated and the other left cold. The MAF system measures air through a unique method. It does that by determining the amount of current needed to keep the heated wire 200F hot from the cold wire. The MAF will change the amount of current that enters the wire and using this method the amount of air will be either increased or decrease. As the Mass Air Flow Sensor is directly linked with the engine, any issue with it can result in disruptive performance. There are some common symptoms which occur when the MAF sensor gets damaged and we will discuss them here. The most common symptoms from a bad mass air flow sensor are slow accelerating and reduced engine power. 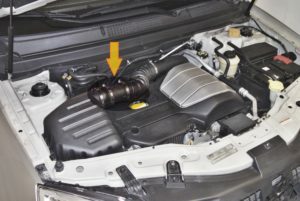 You can also notice a difference in the fuel economy as the main function of the mass air flow sensor is to let the engine know how much fuel it should inject. The most common sign is that the check engine light illuminates signalling something wrong with the sensor and the engine. The check engine light also blinks due to many other reasons, so it is best to have your car scanned for trouble code. Lean idling occurs when too much of air is sourced by the engine while the amount of gasoline is less in comparison. Due to the abundance of air, the combustion process does not take place properly causing a problem with the engine. This problem occurs mainly when the MAF sensor gets dirty and has a contaminated wire. The easy fix is to have the sensor cleaned by a technician. When turning on the ignition, if your car does not start immediately, it may be due to a bad mixture of air and fuel. It is also recommended to have your spark plugs inspected to know exactly the reason for the poor starting. If you notice that your car’s engine drags when an extra load is added, it may be due to a faulty MAF sensor. If more than usual weight is added on the car, the engine uses more gasoline in order to run effectively and with a faulty MAF sensor, the PCM will not determine the right amount of fuel/air mixture causing the engine to drag. A damaged MAF sensor causes a problem with the acceleration at higher speed. If you notice some delay when you step on the gas pedal and the car’s acceleration, it is because of the lack of gasoline reaching the engine. A faulty MAF sensor disrupts the air/fuel mixture, dropping the engine’s performance. The MAF sensor constantly checks the amount of air flowing into the engine and this helps the engine decide the right amount of gasoline needed for combustion. A faulty MAF sensor can give an incorrect reading to the PCM causing the engine to consume too much of gasoline. Where is the MAF Sensor Located? The MAF sensor can either be found in the intake or just before the throttle body. Its location varies from manufacturer to manufacturer, as they fit the sensor based on the engine’s design. You can use the service manual to be sure of the location, or use the internet for a quick search. Check the picture for a clue where it can be located. Fortunately, sensors show signs of failure. If you know what to look at, you can easily identify the issue and make the replacement. A failing MAF sensor will also affect your car’s performance. You won’t be able to accelerate quickly or start your car in the first place. A lot of misfiring will also be witnessed. Another way to diagnose the failing mass air flow sensor is to try to clean it, check the section down below. A lot of times, the problems associated with the Mass Air Flow Sensor occur due to dirt and debris buildup. This particle accumulation over the time results in poor performance of the sensor. The MAF sensor should be cleaned and serviced every six months or whenever you change the engine oil. Moreover, it is a good practice to clean or change the air filter along with the MAF sensor as well. Here we will highlight 3 simple steps required to clean the Mass Air Flow Sensor. The MAF sensor is often located inside or after the car’s airbox and it can be easily removed using a flathead screwdriver. Always remember to not touch the connecting wires as they are delicate and if broken, you’ll need to buy a new sensor. To clean the MAF sensor, there are two ways; The first technique is simple and requires a plastic bag and alcohol. Place the sensor in a plastic bag and rub it with alcohol to clean any dirt on it. 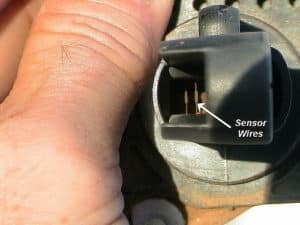 The second technique is to buy a Mass Air Flow sensor cleaner spray from a nearby auto store and use it to clean the sensor. One recommended cleaner is the CRC 05110 Mass Air Flow Sensor Cleaner – 11 Wt Oz. which can be found on the link on Amazon. It is specially designed to clean MAF sensor wires. Once the MAF sensor is cleaned, let it dry for a couple of minutes. After about half n hour, install the MAF sensor again and start the engine. If the check engine light illuminates on your dashboard, it is time to visit the nearest auto-shop and have your car scanned for trouble codes. The mechanic will use a scan tool to check what trouble code is retrieved. The trouble codes from P0100 to P0104 all indicate that something is wrong with the mass air flow sensor. 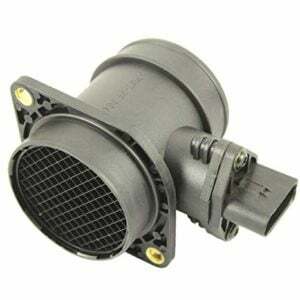 The trouble code P0171 and P0174 are also caused due to a damaged or faulty mass air flow sensor. Another procedure to check the mass air flow sensor is using a voltmeter. To test the sensor, connect it to the voltmeter and measure the signal at different engine speed and compare it with the specific range. If your car produces a digital signal, use a scan tool to read the data. Once you have taken the reading of your sensor, replace it with a new sensor and check again to notice the difference. If there is a significant difference, it means the sensor is faulty and should be changed. A Mass Air Flow Sensor is not so cheap but it is not very expensive either. You could get one for $120 – $300 to which you should add labor costs of $80 – $100. Therefore, on average you are expected to pay $200 to $400 in total for a mass air flow sensor replacement. The price you get for the replacement can vary due to a variety of factors. Firstly, the part itself can come in a number of qualities. You can get a genuine air flow sensor or you could get those off-market sensors. Both would work well but it is possible the cheaper one goes bad sooner than the more expensive option. Moreover, the cheaper quality may not match with your car and your ECU might reject it. Therefore, it is best to go for genuine parts rather than going for cheap aftermarket ones. The second factor is the make and model of your car. Imported cars usually have very expensive parts; because, as you would expect, their parts are also imported. You get the car part after a number of taxes are levied on it. So, it is natural for you to pay more for such a car. However, if your car is locally assembled chances are that you will be let off pretty cheaply. That is why we have listed the price as a range and not as one single figure. The third factor is the labor cost your mechanic charges you. Mechanics are either certified or they are self-taught. It is obvious that the certified mechanic has more credibility since he has a certificate to prove his worth. A self- taught mechanic will have nothing to his name, which means you would be gambling on your chances. The certified mechanic will also charge you a high price, but once you give them your car you can rest assured that whatever problem your car is gone.